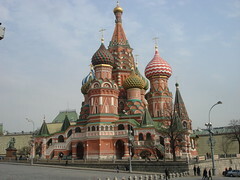 I have wanted to visit Russia for many years. This desire may have been influenced by my communist grandfather and the many books he had via mail-order straight from the USSR itself in the 50s and 60s...... Many of these were patriotic and idealistic showing the people working on the land and in the factories to improve the country. Many of them were also writings from Marx, Lenin and others espousing the virtues of a socialist state. Unfortunately my grandfather died before the Berlin wall came down and the USSR as we knew evolved into Russia. 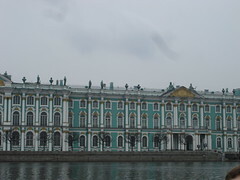 To visit Russia these days is relatively easy (for an Australian passport holder that is). After securing an online Visa invitation, we made 2 trips to the Russian Embassy in Doha for Visa to be added in our passports, with a total cost of $100 each. Qatar Airline flies direct to Moscow in 5.5 hours. So the very day that school broke up for Spring break we rushed to the airport and flew into Moscow, to arrive after flight delays at our hostel, Godzillas, at 4am. Sort of early next morning we are off...walking distance to the center and looking forward to a day, and a week of adventure. Here is a very brief overview of our week. Red Square is amazing. St Basil's, the Kremlin (where we saw the Bolshoi Ballet Company in the State Theatre), GUM Department store (government), Lenin's tomb (not open for visitors the 2 days we were there). 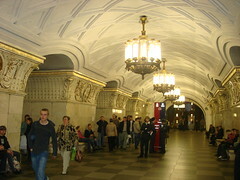 The Moscow metro is a delight, however it is also a challenge to navigate. Luckily we have a colleague working in Moscow who showed us around and got us used to the 'metro maze'. Trains come every 2 minutes on all platforms, from early morning until 1am. Many of the stations are wonderfully decorated, and all in different styles of lighting, painting, sculptures, mosaics etc. I realised coming home that I did not have enough pictures to really show what we saw...I think most of the time we were running to catch another train! 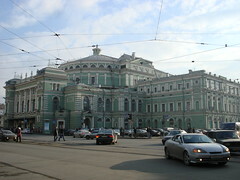 We took an overnight train to St Petersburg. Well, this is a place that lives up to it's reputation! Amazing constructions and awe inspiring collections of wealth. You can see why the Russian people wanted change, how can so few have so much amongst so many? 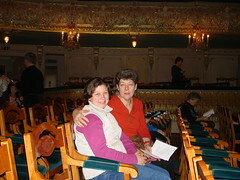 We went to the main attractions, Hermitage Museum where the collection of art works, sculptures and other artifacts is in the millions; the Church of Spilled Blood, an amazing church made with mosaics; the Mariinsky Theatre, known as the home of the Kirov Ballet Company, where we saw Tosca. Our trip to Russia was a life experience. There is still so much more to see, not sure if we will ever get the chance to go back. Language and communication was a challenge as an English speaking traveler. Unlike many countries we have visited in Asia, Africa and the Middle east, Russia is NOT an English speaking or accommodating country. The script is in Cyrillic which makes it difficult to decipher words eg restaurant is 'Pectopah'. Signs therefore are not in English, shop keepers and other service personnel do not speak English and can be rude about attempts to try and communicate. The language of Russian itself is fascinating but I had no success at all in learning it. Strangely, and I do not mean this to be taken the wrong way, the spoken language often sounds like a record playing backwards to my ears. Another aspect of the country is the emerging middle class. So many shops in the two cities we visited were aimed at the fashion conscience younger person. Girls in particular were walking around with the latest fashion in clothes and shoes. Prices were expensive to our pockets. However there is lots to buy if you have the money, and people were spending. Food and drink is not too expensive. Beer and champagne is cheap, vodka (of course) was available for sale on every street corner. Mulit-national restaurants were plentiful (Pizza Hut, McDonalds etc) as were localized restaurants with authentic cuisine. The local pub was a warm haven for a meal and a drink and a friendly place to be. Great to hear your impressions! I visited Russia in 1988 when it was still the USSR and this summer I am looking forward to visiting with my family. Glad to hear about that hostel too and can't wait to check out all the pics on Flickr! Thanks so much for sharing about your trip! I love the pictures too. 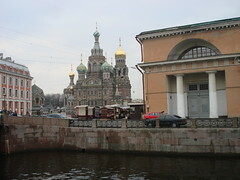 My hubby and I love to travel and Russia is on our list of places to see. Now you have really whetted our appetite for this.